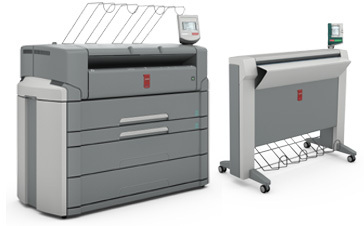 The limits of your current large format document capabilities have risen with the new Océ PlotWave 750. Print more flexibly. Protect vital data more securely. Produce documents faster and manage print jobs more easily. Based on the multi-award winning Océ TDS750, the PlotWave 750 will take you wide-format capabilities to new heights. Choose the media capacity to fit your applications: 2 rolls, 4 rolls, 6 roll, or cutsheet media. The attachable Océ TC4 color scanner enables you to handle both color and monochrome documents. Add the Océ Double Decker Pro Stacker to handle 1,500 A-to-E size sheets for long unattended runs. 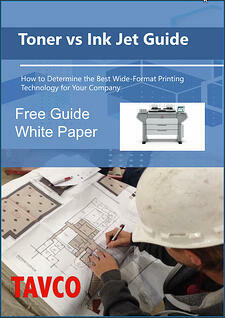 Impress your clients with consistent, high-quality documents via 600x1200 dpi Pico Printing. Advanced Networking and Security - Networking capabilities are supported by stringent security measures. The Windows Embedded Standard 7 controller guarantees you are compliant with the latest IT standards. Fast and Productive - Meet deadlines efficiently with a generous 9 D-size sheets per minute. Plus, the Océ Radiant Fusion Technology allows the machine to consistently be "print-ready" by eliminating any warm-up time. It's possible to get over 27 prints out of the the PlotWave 750 before some competing machines have even started printing. Cost-effective - Earn back your investment with a rapid ROI. The modular design allows you to selectively choose the features that best fit your budget and the size and scope of your specific document needs. Built to last with durable, long-wearing parts, the PlotWave 750 simply out classes any competitor units in the long run. Easy to Use - The Océ PlotWave is ergonomic and a pleasure to use. Everything from the media roll placement to toner loading, to print job management has been carefully thought out and designed with the user in mind. The human interaction experience with the PlotWave 750 is unmatched.